Between their love for vino and their love for eachother, Alaina and Eric were such a sweet couple to work with—and we were so thrilled when they chose Weddings By Dzign to bring their purple wedding vision to life. The duo chose to say I Do at Las Vegas’ Reflection Bay Golf Club in October. We knew the setting was naturally stunning, so our overall goal was to bring out the innate beauty of the area through romantic design details. Alaina chose a color palette of various shades of purple, which ended up looking so stunning against the overcast Las Vegas sky that day. For the bride’s bouquet, Floral By Dzign crafted a tight, focused arrangement of schwartz calla lilies, lavender roses, ivory roses and purple lisianthus. 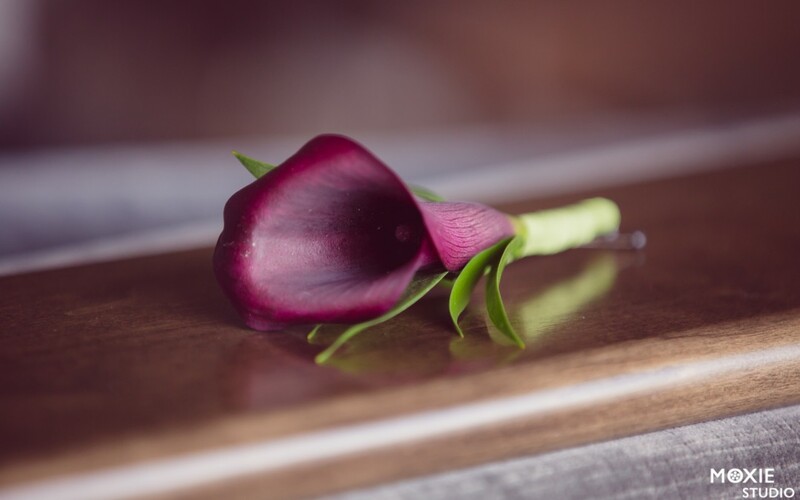 And, for the groom’s boutonniere, our team went with a simple, understated schwartz calla lily. For the ceremony, we brought in a beautiful wooden arbor, which really played into the au-natural setting. We then dressed it up with a suspended crystal chandelier and two floral arrangements consisting of lavender roses, ivory roses, purple lisianthus, purple hydrangea, lavender mums and lush greenery. Overall, the altar space looked so whimsical and ethereal against the backdrop of a grey Las Vegas sky and its mesmerizing reflection on the water. We lined the aisle with lavender rose petals, which collected tiny dew drops as it began to lightly rain right before the ceremony. The weather ended up clearing up just in time for the couple to walk down the aisle, and the photos Moxie Studio captured afterward turned out beautifully with the billowing clouds and a lavender sky in the background. For the reception, Linen By Dzign dressed guest tables in purple luxe linen with ivory napkins and our silver chiavari chairs. Alaina put her talents to work and hand-crafted each of the reception centerpieces, along with the sweetheart table decor. Eric is a sommelier, and Alaina worked to bring out their passion for wine with her design choices. Overall, Alaina and Eric’s dreamy purple wedding turned out to be so whimsical and romantic, and we were absolutely honored to be a part of bringing their vision to life.